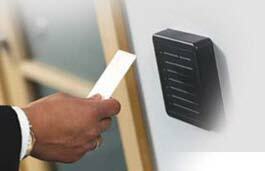 Access control card readers are used in physical security systems to read a credential that allows access through access control points, typically a locked door. An access control reader can be a magnetic stripe reader, a bar code reader, a proximity reader, a smart card reader, or a biometric reader. Smart Space Solutions can implement the most appropriate technology to achieve the level of security required for the available budget. Barcode cards feature a series of alternating dark and light stripes that are read by an optical scanner. Barcode technology is affordable and can easily be applied to cards or other items. However, it’s easy to copy and is the least secure card type. Magnetic stripe cards have a stripe of magnetic oxide tape laminated on the card. They are inexpensive, easy to program, and hold more data than a barcode. Magnetic stripe technology is susceptible to misreads, card wear, and data corruption. These cards are also susceptible to some forms of skimming where external devices are placed over the reader to intercept the data read. Wiegand card technology is a patented technology using embedded ferromagnetic wires strategically positioned to create a unique pattern that generates the identification number. Like magnetic stripe or barcode technology, this card must be swiped through a reader to be read. Unlike the other technologies, the identification media is embedded in the card and not susceptible to wear. This technology is difficult to duplicate making it secure, but it is being replaced by proximity cards due to their improved tamper resistance and touch-less functionality. Proximity cards are a touchless technology, allowing a user to simply pass their card within a specified distance from the reader. The card then transfers only an identification number to the reader allowing access as assigned by security. Smart card are available either for contact or as contactless. The smart card differs from the proximity card in that the processor on the smart card has an embedded operating system and can handle multiple applications such as a cash card, a pre-paid membership card, or an access control card. Contact smart cards require insertion of the card into the reader device, making them inherently slower than contactless cards. A contactless smart card works similarly to a proximity card in that it does not have to touch the reader or even be taken out of a wallet or purse. This difference is that it can hold much more data allowing its implementation in biometric readers.